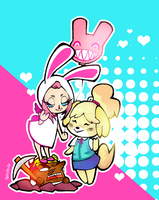 This Is Dedicated To The Upcoming Game, Animal Crossing New Leaf! Hope You Like It! I can't wait for it to come out! Tee hee! Super Smash Bros. Generations Chapter 1Mario Is A Famous Celebrity Around The Mushroom Kingdom. He Is Always Saving Princess Peach And Friends From The Evil King Bowser Koopa. He Has A Younger And Thinner Twin Brother Named Luigi And His Best Friend Yoshi. He Is A Plumber, Carpenter, President Of His Toy Company, Chef, Doctor, And Others. Also, He Is Very Athletic At Racing, Basketball, Tennis, Golf, Baseball, Soccer And More. He Is Always Going For His Adventures. One Sunny Morning, Toad Went To Mario's House And Knocks The Door. He Woke Up And Opened The Door. "Good Morning, Master Mario! A New Adventure Awaits! Because Your Friends Are Waiting For You Outside!" Toad Invited Him To Go On Adventure. "Really, Assistant? I Love Adventures! I Want To Join Them I'm Coming, Everyone!" Mario Is So Excited To Go Outside. A Few Minutes Later, He Dressed Up In His Plumbing Outfit, Packed Up His Things And Ready For His Adventure. They Went Outside And Running Through Peach's Castle Where His Friends Are Waiting For Him.